There is something cosmic in the zeitgeist lately. It is 2012 after all, and the End of Days looms. I seem to know more and more people who charge crystals in the desert and the Integratron comes up in conversation with surprising frequency. Artists are exploring psychedelia and meditation seems an increasingly common event in performance. The decommissioning of the Shuttles earlier this year provided an opportunity for artists and others to reconsider our relationship to space exploration as we witnessed the passing of these once-futuristic vehicles into the realm of the nostalgic artifact. Maybe there is a growing urge to escape the bleak gravity of our situation here on Earth, at least for a little while. The recent solar eclipse and transit of Venus gave people a reason to look into the cosmos, and perhaps because of social media, it seemed like more people than ever did. A kind of collective experience emerged in the form of endless online documentation, and in a way it was comforting that these kinds of cosmic events still hold our fascination enough to buy up every pair of solar sunglasses at the Griffith Observatory. The juxtaposition of an increasingly mediated and high-technology landscape with a renewed interest in contemplating the mystical in nature seems a curious effect of our current moment. Perhaps during uncertain times, there is a tendency toward a kind of nostalgic retrogression, a yearning for a more naïve kind of awe that seems lost to the dissociative effects of technology. The vertigo brought on by vast technological change was part of what inspired the Romantics to seek the sublime in torrential seas and epic sunsets. They defended the import of the emotional dimension of being, in the face of a growing rationalization that left less and less room for the mystical, the ineffable. As science seemed ever more capable of explaining the mechanics of our world, perhaps there opened up a yearning for reverie. And perhaps in our own time, we are again in the throes of a vast technological shift that seems to make everything accessible, everything knowable. Information is everywhere being catalogued, organized, archived. Yet there is still something to be said for watching Venus cross the face of our Sun, the reverie it induces hardly dulled by the ubiquity of its documentation. Once the domain of folk knowledge, the study of cosmology is now in the hands of theoretical physicists, whose research into the nature of the universe has receded beyond the event horizon of our comprehension. Modeling the solar system with mechanical orreries seems quaint compared to the task of illustrating a ten-dimensional universe. String theory, the front runner according to many scientists in the race to find a Theory of Everything, holds a kind of pop interest even if almost no one can understand the mathematics it’s based on. 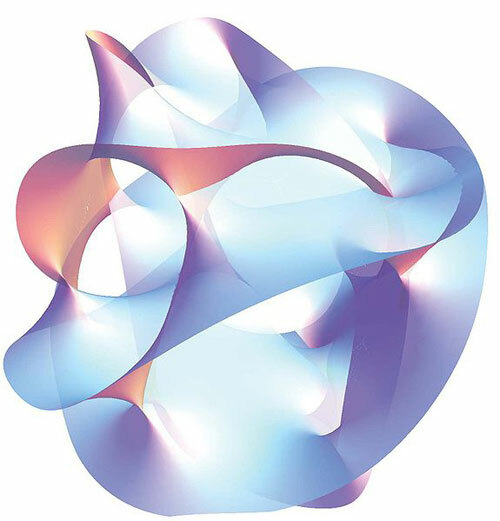 Part of the frustration of understanding string theory is assuaged by the beautiful images scientists make to illustrate these new dimensions, as in the Calabi-Yau manifolds. As a layperson, aesthetics are maybe the only way to relate to the increasingly complex explanations of our cosmos. Rendering of a Calabi-Yau manifold. Image source: Wikimedia Commons. The recent exhibit curated by Stephen Nowlin, “The History of Space Photography” at Art Center’s Williamson Gallery, made a case for the artistic interest of scientific imagery. The show assembled an amazing selection of images, from the earliest days of photographing the moon to the most advanced imaging of deep sky phenomena. 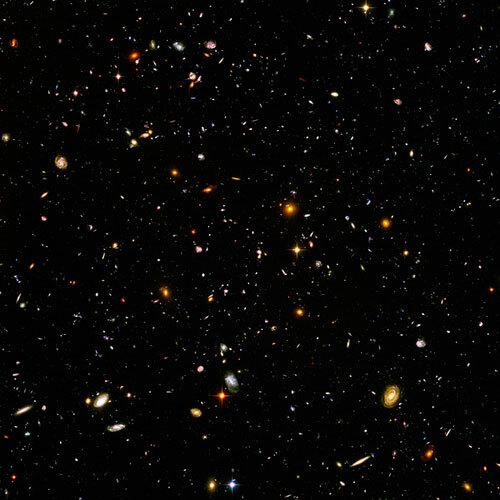 These colorful and vast vistas of nebulae and galaxies, are to some degree fictional, in the sense that they are stitched together from many exposures and render visible parts of the spectrum of radiation the human eye wouldn’t perceive. Self-consciously created to inspire a sense of awe at their beauty, many are dramatically composed (there is no “up” or “down” in space), the colors chosen for aesthetic impact. 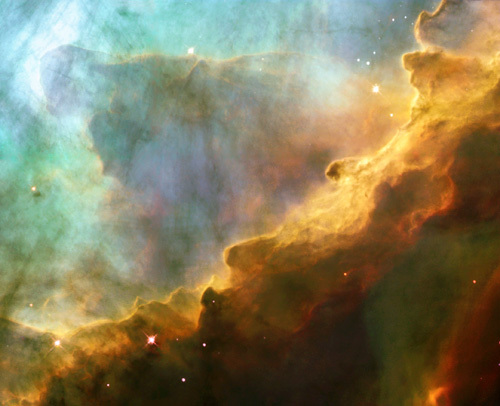 NASA’s image of the Omega nebula in the Sagittarius constellation is an extraordinary example of the genre. 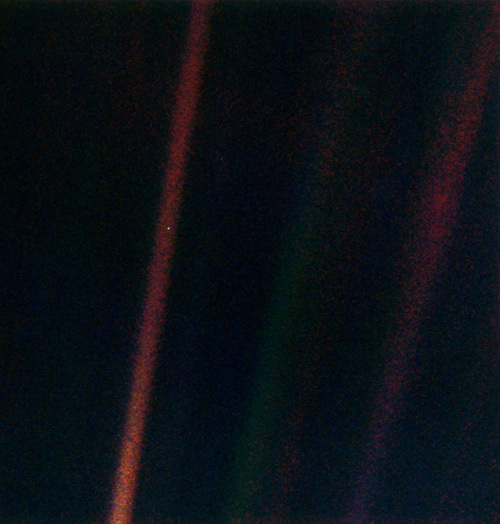 The lack of a reference point in terms of scale is typical of this kind of space photography, and the size of something often remains an abstraction, understood, perhaps paradoxically, as feeling the limit of one’s cognitive abilities. This small corner of the Omega nebula represents a distance of 3.1 light years. While I can’t understand that kind of scale sensorially except via the vertigo that accompanies the attempt, this in fact, is part of the power of cosmic imagery. That feeling is fundamental to the pleasure and terror resulting from our contemplation of the cosmos. It is a dramatic landscape, with its diagonal composition, a candy-colored palette of translucent blues, greens and golden yellows suspended above the earth tones below. 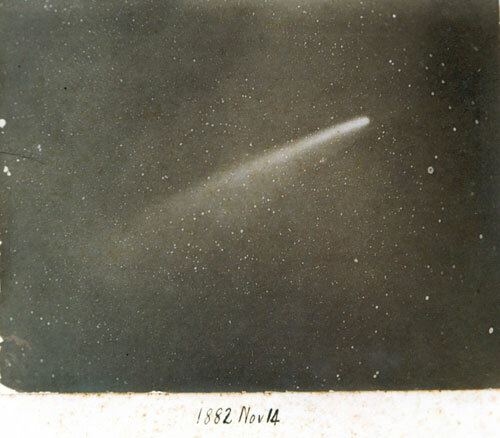 Described on the Hubble site as “resembling the fury of a raging sea”, the connection to a certain tradition in art making seems self-conscious. I can’t help but think of Joseph Mallord William Turner’s torrential storms and epic landscapes, and the similar project of representing the sublime. In particular, Turner’s 1839 painting, Modern Rome—Campo Vaccino, has an uncanny similarity to the Omega nebula image. On view at the Getty, the luminous quality of the canvas is stunning in person. Like the nebula, it is composed along a diagonal from lower left to upper right, the foreboding darkness of the lower right corner anchoring the foggy pastel vista of the ruins of Rome. Sentimental and dreamy, but also frightening, Turner’s painting stirs a sense of paradise lost. The small figures in the foreground are vulnerable, going about their daily work under the specter of the ruined column on the right, the relic of a past majesty. The large scale of things here is articulated in terms of space, but also in time, through the portrayal of the vastness of history, Rome’s grandeur and its demise, the triumph of human civilization and the insignificance of the individual in the stormy seas of history. J.M.W. 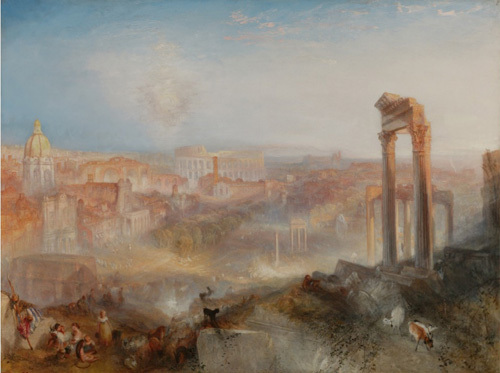 Turner, Modern Rome—Campo Vaccino, 1839. Image Credit: J. Paul Getty Trust. There is pleasure in annihilation, and both images overwhelm the senses while threatening the will by dwarfing the self in relation to space and time. But, if we are able to lose ourselves in this contemplation, to paraphrase Schopenhauer, we might feel instead exaltation in its immensity. This feeling might be a little like freefall, a kind of falling in to something, but not really something, and not nothing either. A freefall into the now/here, a release from up/down, a sense of the coordinates of your own time and space coming into accord with where and when you are. A kind of reverie perhaps, unencumbered by desire, held in suspense. These two images offer that kind of reverie, a sensorial freefall into waves of translucent color. If these two images offer a celebration of the sublime through a sense of the extraordinary, could an engagement with banality also depict or inspire the sublime? In his book The Life of the Cosmos, physicist Lee Smolin asks, “Why is the universe full of stars?” If it seems like an innocuous question, it takes on more gravity, if you will, when you consider the notion that the universe could have been full of almost nothing at all, or perhaps so much more full that it would have collapsed back in on itself before stars could even form. These formations are the result of the specificity of certain values, like the mass of protons and the force of gravity. If these values are tweaked only slightly in computer simulations, very different universes than ours evolve. The proliferation of stars grows increasingly conspicuous. The Mediocrity Principle states that observed phenomena tend to be typical rather than exceptional, a rule of thumb that emerged from centuries of failed anthropocentric models of the world. From Copernicus to Darwin, science has had to abandon the uniqueness of our existence in light of evidence to the contrary, at every scale. This is one of the tensions that runs throughout the history of cosmology. Are we made in God’s image or are we simply the precipitate of a material universe whose conditions are such that we are a statistical probability? To me, this most banal and mind-numbing articulation of the cosmos finds some expression in the drawings and paintings of Vija Celmins. Her starry skies could not be further from the pastel symphonies of either Turner or Hubble. But they have an aura that inspires a state not wholly different from those brands of reverie. Her monochrome canvases impress upon the viewer a kind of large scale, not in terms of space but in terms of time. Painting the stars again and again, sanding the image off and starting over, according to some mysterious rubric that is, to us, unfathomable. Hours and hours of stars hover unseen, underneath layers of black. With no reference point, no context, they offer their own sort of freefall, a falling into, away and back out. This is an ascetic sublime, of the sort that Schopenhauer might approve, with its somewhat bleak resistance to charm or attraction. But still, they ask us to contemplate the ineffable, the touch, the time spent. Hers is a dance of futility that starts to question the notion of accuracy, and the logic of the metric by which she judges her representations. Perhaps this kind of monastic tedium becomes a performance of the sublime, albeit of a different temperament than the Romantics proposed. In the same way that the image of the nebula both negates and celebrates our ability to contemplate it, Celmin’s obsessively repetitive marks both deny originality while asserting the importance of the artist and her laborious efforts. Reverie may have many forms, some sentimental, some of an ascetic sensibility. But either way it seems to be an increasingly endangered state of being. Surely we are not too distracted, too cynical, yet, to cease searching for exaltation, even in an increasingly documented and archived world. In fact, even as we obsessively catalog and organize the facts and documents of our existence, it seems that the truth recedes even faster. Aesthetics may be the only methodology that offers the kind of understanding that is missing from our ever larger map. Perhaps embracing a state of freefall is not a cowardly escape, but a subversive act in our chaotic times. In a state of reverie, perhaps we are not a vanishing nothing, but simply, and powerfully, now/here. 1] Arthur Schopenhauer, The World as Will and Representation, (New York: Dover, 1969) 205. 4] Lee Smolin, The Life of the Cosmos, (New York: Oxford, 1997) 41. 6] The full quote: “Look again at that dot. That’s here. That’s home. That’s us. On it everyone you love, everyone you know, everyone you ever heard of, every human being who ever was, lived out their live. The aggregate of our joy and suffering, thousands of confident religions, ideologies, and economic doctrine, every hunter and forager, every hero and coward, every creator and destroyer of civilization, every king and peasant, every young couple in love, every mother and father, hopeful child, inventor and explorer, every teacher of morals, every corrupt politician, every “superstar” every “supreme leader,” every saint and sinner in the history of our species lived there—on a mote of dust suspended in a sunbeam.” Carl Sagan, Pale Blue Dot: A Vision of the Human Future in Space (New York: Ballantine, 1994) 6.